Sunset is a unicorn covered in flippable sequins that alternate between orange and a pink colour. 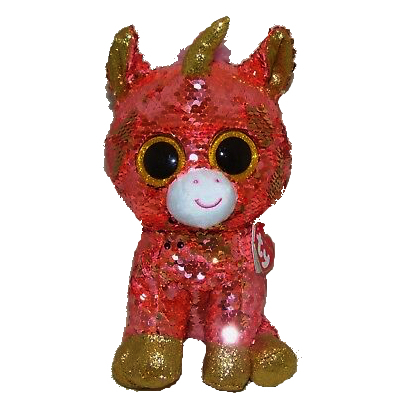 She has large, glittery gold button eyes and a sparkly gold horn. Her mane is fluffy and pink, as is her tail. The inside of her ears and her hooves are also sparkly gold. Sunset was released in January 2019. Her Birthday is on 7th October. This is the medium 9″ Flippable version of Sunset. She was also released as a small 6″ Flippable and as a key clip.